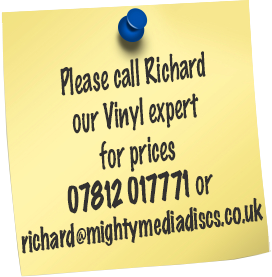 Vinyl- to include Cutting, metal work, vinyl pressing & application of a standard white label. 5 Test Pressings are just £30.00 which includes delivery. ALL ORDERS ARE SUBJECT TO AN OVER/ UNDER SUPPLY OF UPTO 10%, WITH MONIES BEING ADJUSTED ACCORDINGLY. CD MASTERS MUST BE CORRECTLY LAID OUT & SUPPLIED WITH TRACK LIST & TIMES.